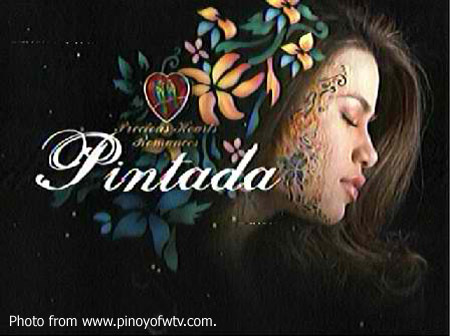 Home / Entertainment / Pintada Ends; Sequel Coming? Pintada, the teleserye that I had been following before the regional news, finally came to an end yesterday. While I respect what the writers were trying to achieve, I’m afraid the way the ending went also gave me this feeling that they somehow lost their way. It was always a foregone conclusion that Lyza Alvarez – played by the lovely Denise Laurel – would end up in the arms of Sev Sandejas – played by Martin del Rosario – as the series’ final resolution. Unless a sequel is being planned sometime in the future, then the case of Karen Sandejas/de la Cruz – played by Bernadette Allyson – and Victor de la Cruz – played by Lorenzo Mara – was not properly resolved. While I am somewhat disappointed in the ending, to a great extent that is because the series deserved more. Despite some weaknesses to the storyline as the series went along, it was still charming, engrossing and was thematically bold in examining an older woman-younger man relationship. Waiting for the regional news will not be the same without Pintada. The sudden turn-around of Noel Crisostomo – played by Lemuel Pelayo – from good guy to villain was unexpected. This was as forced as twists can get; and that Crisostomo would end up falling to a hail of bullets was a lame resolution to the love triangle involving him, Lyza and Sev. I thought that was a cop out! Perhaps, in real life, the good guys are the ones who are made to suffer and the bad guys are the ones who escape judgment. But this was a teleserye, for crying out loud! The entire series built up to Karen and Victor being exposed for their crime and corruption; but although it can be argued that Noel’s corporal punishment on Karen was the latter character’s resolution, Victor leading a squad of policemen to put down Noel was strange. After being the villain for so long, suddenly Victor was playing the role of the hero and liberator. That part was so badly done, full stop! If it was any consolation, Noel’s becoming a suddenly dark character brought out the best in Pelayo. As the young business tycoon with a hidden past, Pelayo’s acting was frequently bland to the point that he even looked miscast. When the character turned into a dark jealous lover and vengeful castaway son, that was when Pelayo’s acting became believable. He was particularly convincing when Noel was torturing Karen to make her pay for the life he had been forced to live and when he cornered Lyza in her room to force her to marry him. Who would have thought Pelayo had that in him? He used his eyes and sneer to at times look deranged and even downright evil. Considering the actor’s boy-next-door good looks, his transformation when acting out Noel’s hidden alter ego was quite simply brilliant! In a way, Pelayo’s development mirrored that of del Rosario. The latter was ineffective as the gregarious high school student trying to catch the attention of his teacher Lyza. The moment Sev’s character became brooding and more mature, this was when del Rosario’s pensive scowl gave his character depth and authenticity. It was actually quite uplifting to have witnessed both gentlemen get better at their craft with each segment. Credit, it has to be said, must go to the series’ director. What a pity that a series that promised so much was made to end as though it was dictated by a scheduling problem, i.e. that it had to end yesterday because there is another series scheduled to start next week. Holes were starting to appear in the story after Lyza left prison after serving time for a crime that she did not commit. Her return to Cervantes to hopefully win back her siblings was believable. Her plotting revenge with Noel on those who ruined her young life was also understandable and also probably how things would be in real life. The problem here was that Lyza’s character was built up to be that of a martyr. Neither was Laurel right for the vengeful ex-con that was being asked of her. That was why the better resolution to the entire story would have been to leave Lyza as the pure and sweet character that was first introduced to the audience – and for this, Laurel was perfect – and to allow karma to catch up with Karen and Victor as the story wound down to a close. In keeping with the muddled ending, Sev’s former girlfriend Samantha Diño – played by Yen Santos – connived with Noel to kidnap Lyza’s siblings then became remorseful and called up Sev to tell him their location. This was the very same Samantha on whom precious screen time was spent making her look like the overly jealous jilted girlfriend who would do anything to get Sev back. As with Victor’s character, was she hero or villain? Whatever happened to Vito, played by James Reid? This character at one point offered a soft landing for Samantha after she and Sev broke up; but Vito’s character was done away with and forgotten. Why introduce him in the first place when he would ultimately turn out to be totally inconsequential to the story? That Noel was Karen’s child was a no-brainer; so if that was intended to be a twist, then it failed. The attempt to rationalise Karen’s evil by casting her as a guilt-laden mother who gave away her first child confused and softened her character and something that I felt was unnecessary. I know all these, of course, because Pintada is the first-ever teleserye that I watched from start to finish, barring an episode here and there when I had to be away or there was a power outage. While I am somewhat disappointed with the ending, to a great extent that is because the series deserved more. Despite some weaknesses to the storyline as the series went along, it was still charming, engrossing and was thematically bold in examining an older woman-younger man relationship. Waiting for the regional news will not be the same without Pintada. So why were Karen and Victor not brought to justice before the law? Even a scrolling text epilogue would have sufficed. Was Noel killed at all? He fell, yes; but was the audience to assume that all the policemen’s shots actually hit and were fatal? The series ended with Lyza and Sev getting married – and was that Samantha happily grinning that Sev was marrying somebody else? The final shot of Lyza and Sev waking up to the mist up in the mountains after apparently having made out during the night was quite delightful and would have been perfect had the ending not been so rushed with issues still unresolved. On the other hand, maybe the story continues in a second series, who knows? Now that would be good, wouldn’t it?